Function gets a high-fashion makeover in this sleek, modern watering can. Featuring minimalist, Swedish design by Pascal Charmolu, the central water reservoir is a simple metal cylinder that fits easily in your hand. 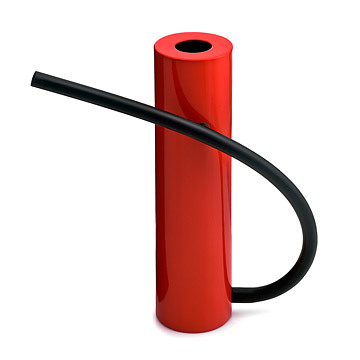 A flexible, silicone hose emerges from the bottom of the tube, allowing you fluid access under and around dense greenery. To use, simply hold the tube lower than the level of the canister, and let gravity do the work. A built-in magnet holds the tube securely in place when not in use. Made in China. It's an interesting design that is fun to dabble with but it is awkward to hold and doesn't hold much water. Yet it can't really be made larger to hold more water because it's already heavy enough to be a challenge to hold when filled - since there's no grip of any sort and it's a mandatory two-hand process. If you don't manipulate it correctly it's very easy to dribble. Much too expensive for what it is. Function gets a high-fashion makeover in this sleek, magnetic watering can.